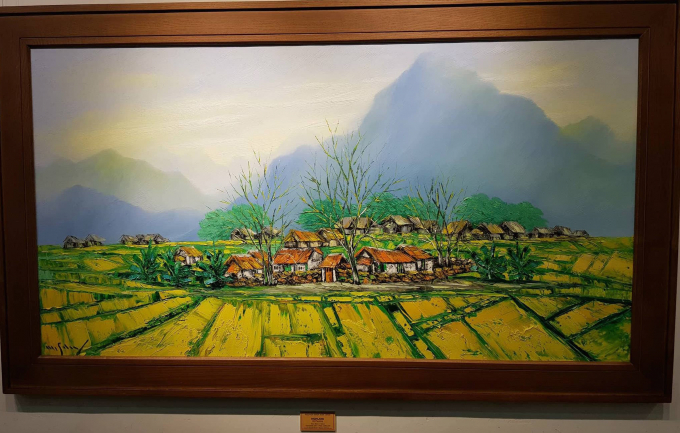 On 3/10/2017, painter Nguyen Minh Son opens the exhibition “Landscape of Vietnam” at the Fine Arts Exhibition, 16 Ngo Quyen attracts crowds to visit. 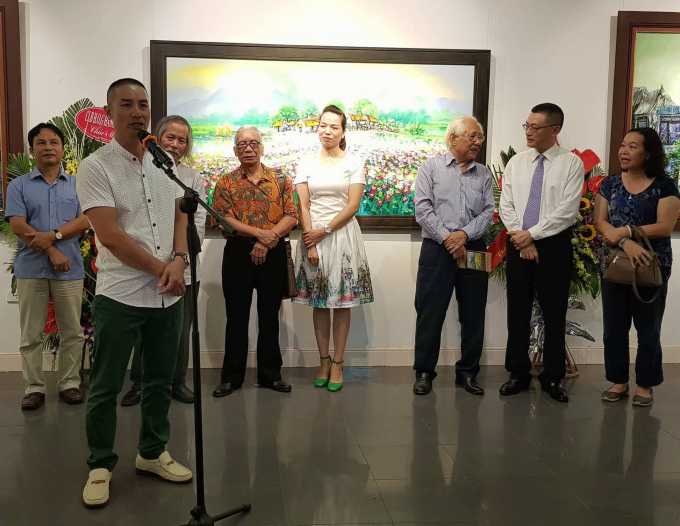 Attending the opening was the artist Luong Xuan Doan – Standing Vice President of the Vietnam Fine Arts Association; painters Nguyen Xuan Thuy, vice president of the Hanoi Fine Arts Association, overseas Vietnamese ambassadors, international visitors, and many colleagues, visitors love paintings. With oil paintings, painters Nguyen Minh Son launched more than 30 colorful paintings of the landscape of Vietnam. The paintings displayed at the exhibition give the viewer many emotions, talents and souls that the author submits to the paintings. Mr. 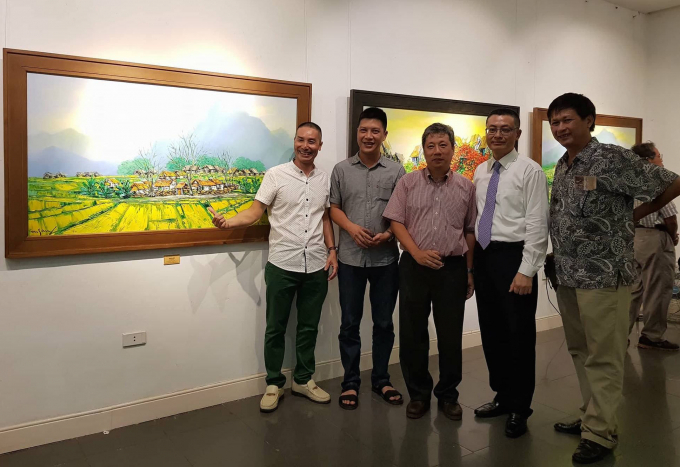 Vu Quang Minh, Ambassador of Vietnam in Cambodia to share exhibition: I personally have a charm with painter Nguyen Minh Son paintings for a long time, painter’s paintings are very own style, unique, close to life of the country, people of Vietnam. The most special thing is that Son painter paintings are crowded with my international friends like the UK and other countries where I worked. Through the exhibition, painter Nguyen Minh Son has shown his own “I” through each work. Daily life experience, landscape painting is a popular genre, so it’s easy to feel for the audience so perhaps the majority of painters draw more or less on the genre. To assert themselves in this category, the viewer has felt the writing, internal strength and emotional power of the author to the viewer in a “durable” and strange attraction. With the use of pen and knives plastered with oil paint and the creative in each stroke, the expression makes each artist’s paintings have strong and flexible features. Exhibition viewers not only love painters Nguyen Minh Son with their own points but also feel the choice of color tone, brilliant as: Red, yellow, orange, blue, purple … attract the soul to see each other detail. Nguyen Minh Son paintings of the landscape of Vietnam express the whole features of the country of Vietnam with a rich tradition of agriculture; Landscape is associated with roof painting, boat, river, village gate, bridge, wells … painters are replaying in the minds of viewers scenery simple life of farmers in Vietnam. Started painting debut in 2006, painter Nguyen Minh Son has many individual exhibitions, collective on many different types of paintings. But the author always gives the landscape of Vietnam a love as a “favor”. Therefore, the paintings of Vietnam Nguyen Minh Son has been known, was introduced in: the United Kingdom, the United States, Hong Kong, Korea, Singapore … many people warmly welcome. The exhibition runs from October 3 to October 10, 1977.